Welcome back to another jam-packed episode of the SMC Podcast! We’re at #30 this week, and we’ve got tons in store for you! First, Leo and Tim talk it up about role-playing novels, the new Punisher comic, and Comixology’s 100 comics for $10, and that’s just in the beginning of the show! The News follows next with some very interesting topics: John Campbell’s less than professional behavior involving his Kickstarter, and Eric Stephenson, the publisher of Image Comics, lets loose during ComicsPro about the current state of the industry. 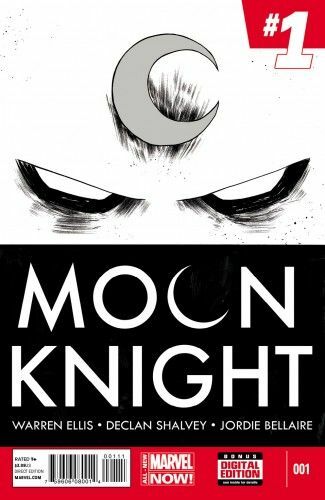 Follow that up with reviews of Moon Knight #1, the current addition to Marvel NOW!, and an Indie book by Black Mask Studios called Liberator/Earth Crisis: Salvation of Innocents #1. The Weekly Distraction focuses on Collectable Card Games this week, as we talk Magic: The Gathering, Legend of the 5 Rings, Yu Gi Oh, and more! Listen to it! Love it! ENJOY IT! Image Publisher Eric Stephenson’s speech during ComicsPRO. John Campbell’s less than professional behavior following his Kickstarter! Sweet! Great to see. Tim back at it! Thank you! It feels super sweet to be doing the podcast again!